The coat of arms consists of three colours namely green, argent and gold. 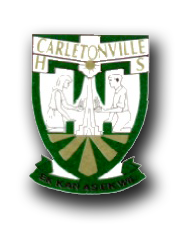 Green symbolizes the new beginnings, growth, harmony and abundance that were experienced when Carletonville High School arose as a dignified high school in 1953. The argent (white/silver) background in the badge symbolizes purity, peace, truth, joy and glory. These are all values that we believe in, cling in striving to develop learners into fully-fledged adults. The gold symbolizes not only the gold that led to the discovery of our town, but is also symbolic of God, the centre around which our existence revolves, in the form of a sun with rays shining over us. The ten rays are symbolic of our commitment to perfection. Within the field a boy and girl are kneeling, each with an empty chalice in their hands, who humbly and with gratitude receive knowledge and undeserved talents from God. The empty cups are symbolic of the journey that they should go on to discover their abilities. The boy and girl are also symbolic of the youth and the future of our country. In the middle of the field is an obelisk, which is crowned with the sun that gives honour to our past and present, but also draws attention to what the future might hold. The motto “Ek kan as ek wil” is written on a simple green scroll. The meaning rests on the Christian principle that any task at hand can be accomplished with total faith in God who provides us with the power to do so and that He continuously guides and leads us. The school’s flag has many similarities with the coat of arms. The flag consists of three symbolic colours such as the badge with almost the same design as our country’s current flag. 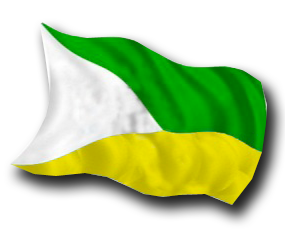 The school’s flag consist of three colours namely green, argent (silver/white) and gold. An argent triangle or prism to the left of the flag is symbolic of all the pupils in the school: the diverse culture and colour groups. As light is divided into the different colours of the colour spectrum, so diverse is the symbolic representation of the learners in Carletonville High School although as all these colours travel through a prism they change direction and speed to form a single stream of unified silver/white light. There is a green canton at the top of the flag which is symbolic of growth and new life. A gold or yellow canton is found on the bottom beneath the green, which is a symbol of the gold on which the origins of our town are based upon, but it is also symbolic of the power that we need granted daily by God as He supports us in our growth and development. Tradition wants the flag to be hoisted at the beginning of each working day before sunrise at 7:15 am; before sunset the flag must be lowered again, but during school days it must be lowered 13:50. Two prefects per schedule are responsible for this. The prefects, who are responsible for the flags, must get permission to lower the flags daily, take care of them and to immediately put them away during rain. After the national flag and school flag have been folded correctly for the next day’s use, it should be stored in the school’s safe. The flags must be hoisted and lowered ceremonially. When observed you ought to stop and show respect when the flags are being hoisted and lowered. Flags must always be flown correctly, in the case of the national flag the black chevron must be against the pole with the red canton facing upwards. In the case of the school’s flag the white chevron must be against the pole and the green canton facing upwards. When the national flag is hoisted along with the school’s flag, either flag must be hoisted on seperate mast and when observed the South African flag should be presented on the left side (as seen from the front). The National flag must be hoisted before the school flag. The moment both flags reach the top it is custom to first open the National flag followed by the school flag. The National flag must be lowered after the school flag (first up last down). It is important that the flags don’t touch the ground. It is an insult when a dirty flag is hoisted. If a flag can’t be repaired, it should be destroyed by burning it. Flagpoles should be well maintained. Both flags must be handled with dignity and respect at all times. National protocol states that flags should never touch the floor or ground; its not permitted to drape flags as table cloths or in front or over a pedestall: flags should not be used to unveil a statue, plaque or cornerstone; it is also not permitted to use a flag to start or end any form of race or competition.